Background: A small number of studies used nailfold capillaroscopy (NC) in the evaluation of nailfold capillary changes in Behçet's disease (BD). The purpose of this study was to investigate the characteristics and frequency of nailfold capillary changes in BD by dermatoscopy and videodermatoscopy and to develop a scoring system for those capillary changes to predict the activity and severity of the disease. Methods: We performed NC on 40 BD patients and 20 healthy controls with dermatoscopy and videodermatoscopy. Capillary morphology, distribution, and density were analyzed qualitatively and quantitatively. 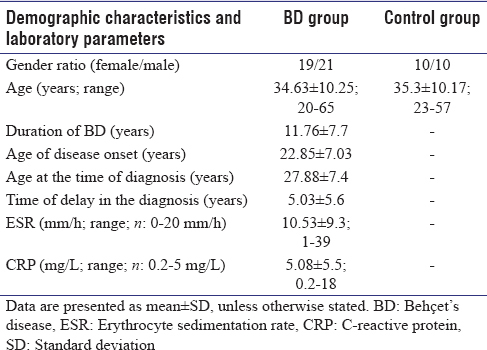 We also assessed the activity and severity of the disease with BD Current Activity Form and BD Severity Score Classification and evaluated the relation of these scores with morphology scores and capillary density. Results: Capillary morphologic alterations were encountered significantly more in BD group (P < 0.05). Loss of continuity in capillary loops and irregularity of capillary distribution were significantly more frequent in BD group compared to healthy controls (P = 0.003 and P < 0.001). Morphology score was significantly higher in BD patients compared to control group (P < 0.001); however, we could not detect a significant relation between capillary morphology and density and the activity and severity of BD. Conclusion: Although we could not demonstrate a significant relation between capillary changes and the activity and severity of BD, we consider that NC performed with dermatoscopy can reflect the presence and extent of microvascular involvement and thereby might have diagnostic and prognostic value in BD. Behçet's disease (BD), described for the first time by a Turkish physician, Hulusi Behçet in 1937 as a triad of recurrent aphthous stomatitis, genital ulceration, and relapsing uveitis, is now considered as a multisystemic vascular disorder characterized by mucocutaneous, ocular, pulmonary, cardiovascular, neurological, gastrointestinal, and articular manifestations. 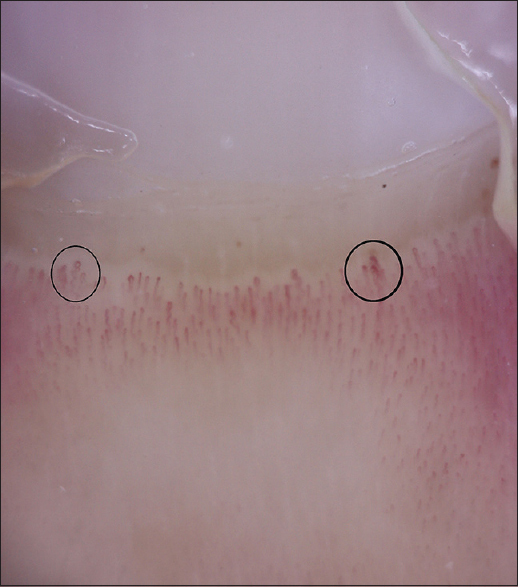 Nailfold capillaroscopy (NC) is a safe and reliable technique that examines the morphology of nailfold dermal papillary capillaries, thus enabling prediction of microvascular involvement mainly in connective tissue diseases. The capillaroscopic results of dermatoscopy and videodermatoscopy were reported to be comparable to those described by other capillaroscopic instruments.,,,,,,,, Thereby, NC performed with dermatoscopy and videodermatoscopy may be considered to have diagnostic and prognostic value in BD. The objectives of this study were to detect the characteristics and frequency of nailfold capillary changes in BD by dermatoscopy and videodermatoscopy, to analyze their possible relation with activity and severity of the disease and to develop a scoring system for these features to predict the activity and severity of the disease. This study was designed as an observational case–control study. Institutional Ethics Committee of our research hospital approved the project (E-14-375), and a written informed consent was obtained from all participants included in the study. We prospectively studied BD patients and frequency-matched healthy controls by age and gender. The participants were selected consecutively from the patients who were admitted to the dermatology department of our hospital between January 2015 and January 2017. All of the patients with BD fulfilled the classification criteria of International Study Group for BD (ISBD). Patients and controls who had any connective tissue disease, Raynaud's phenomenon, cardiovascular disease, coagulopathies, any deformities on the fingers due to trauma or surgical intervention, radiotherapy history, and who were pregnant/lactating were excluded from the study. Demographic features and routine laboratory examinations (including acute-phase reactants) were recorded for BD patients. Treatment history for BD and history of smoking were recorded for the participants. The patients who described arthralgia were evaluated for arthritis by a rheumatologist. The activity of the disease was evaluated using BD Current Activity Form (BDCAF) of ISBD, and BD Activity Index Score (BDAIS) was calculated for each BD patient. Patient's perception of disease activity and clinician's overall perception of disease activity (the thoughts of the patient or the clinician on the disease course for the past 4 weeks) were evaluated by the help of a visual analog scale including seven different facial expressions on BDCAF (on a scale of 1–7, ranging from very bad to very good). The severity of the disease was assessed according to the BD Severity Score Classification of Krause, and a systemic severity score was determined for each patient. 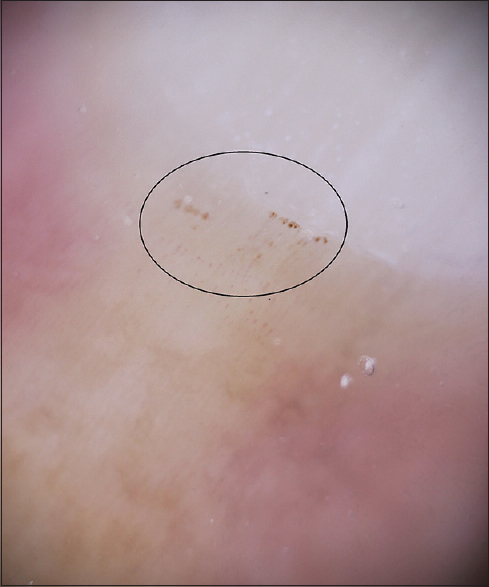 NC was performed with a handheld dermatoscope (DermoGenius II dermoScan) and also with a videodermatoscope (MoleMax HD; Derma Medical Systems, Vienna, Austria). All ten fingers of the participants (excluding fingers affected by recent local trauma) were examined using a transparent gel for better visualization of the capillaries. The nailfold images were obtained by attaching the dermatoscope to a digital camera (Canon EOS 450D-18–55 mm lens) and also by recording images at ×30 in videodermatoscopy. Dermatoscopic and videodermatoscopic images were evaluated by an expert dermatologist. The evaluation of the nailfold capillary system was performed morphologically and morphometrically. Since we had observed that the resolution of the images taken from the handheld dermatoscope attached to the digital camera was higher than the resolution of videodermatoscopic images in our preliminary study, morphologic evaluation was performed from dermatoscopic images obtained from the digital camera. Morphometric examination of the capillary density was performed by a scientific image measurement software (ImageJ version 1.51q for Windows, NIH Image, Bethesda, Maryland, USA) from the videodermatoscopic images for standardization. Capillary morphology, distribution, and density were analyzed based on Maricq's criteria modified by Bergman et al., Accordingly, capillary morphology was evaluated by enlarged capillaries (megacapillaries), deformity of the capillaries (tortuosity, branching, or angulation), presence of microhemorrhages (at least two punctate bleedings around a single capillary), and loss of capillary continuity (avascular areas) [Figure 1], [Figure 2], [Figure 3], [Figure 4]. Capillary vascular anomaly was defined as the presence of at least two morphologic features in at least two nailfolds. For each participant, we recorded the number of nailfolds (n = 10) in which each feature was observed and total number of that feature in all the nailfolds (values over 5 were assumed as 5). Total morphology score was calculated by multiplying the number of nailfolds, for which we have observed a specific feature, with the total number of that feature in all of the nailfolds, and finally taking the sum of all results. Capillary distribution was evaluated as regular (scattered homogeneously and in parallel) or irregular. Capillary density was measured by counting the number of capillary loops per mm in each nailfold, and finally, the mean number of loops in all of the nails analyzed for each patient was taken into consideration. IBM SPSS version 21, IBM Corporation, New York, USA was used for data analyses. All of the defined parameters were analyzed by comparing the patient and control groups. The descriptive statistics were presented by frequency, percentage, mean, median values (min, max), standard deviation, and interquadrate range values according to groups. The demographic and clinical characteristics of the patient and control groups were investigated using Chi-square test. The difference between capillaroscopy scores was evaluated with Student t-test or Mann–Whitney U-test according to characteristics of score distribution. The correlation between disease activity and capillaroscopy scores in the patient group was analyzed with Pearson or Spearman correlation tests, where necessary. P < 0.05 was considered to indicate statistical significance. In total, 40 BD patients (19 women and 21 men) and 20 frequency-matched healthy controls (10 women and 10 men) by age and gender were enrolled in the study. The mean age of the patients was 34.63 ± 10.25 years (range: 20–65). The mean duration of disease was 11.76 ± 7.7 years and the mean age was 22.85 ± 7.03 years at the disease onset and 27.88 ± 7.4 years at the time of diagnosis. The mean time of delay in the diagnosis was 5.03 ± 5.6 years. The mean age of the healthy controls was 35.3 ± 10.17 years (range: 23–57). The mean erythrocyte sedimentation rate (ESR) was 10.53 ± 9.3 (range: 1–39) (N: 0–20 mm/h), and the mean C-reactive protein (CRP) value was 5.08 ± 5.5 (range: 0.2–18) (N: 0.2–5 mg/L) [Table 1]. Thirty-seven patients were being treated with at least one systemic agent for BD. Colchicine was the most common agent (n = 35). The other agents were azathioprine (n = 9) and corticosteroids (n = 3). In 40 BD patients, 55% (n = 22) had a history of arthralgia, whereas only 10% (n = 4) was diagnosed with arthritis by a rheumatologist. There was a history of deep vein thrombosis only in 10% (n = 4) of the BD patients. Twenty-two (55%) patients and six (30%) healthy controls were smokers. In the evaluation of BDCAFs, the mean perception of disease activity scores was 5.03 ± 1.50 for the patients and 4.56 ± 1.66 for the clinician. Although the perception of disease activity score was slightly higher for the patients than the clinician, it was not statistically significant (P = 0.47). Similarly, we could not detect any correlation between patient's or clinician's perception of disease activity scores and acute-phase reactants (ESR and CRP). When all BD patients were considered, the mean BDAIS was 3.20 ± 2.02 and the mean score of severity was 5.44 ± 2.41. There was a positive correlation between the severity score and BDAIS (P = 0.004 and r = 0.34). When we compared capillary morphologic features between BD and control groups, we determined that the scores of megacapillaries, deformity of capillaries (tortuosity/branching/angulation), and microhemorrhages were significantly higher in BD group, respectively (P < 0.001, P < 0.001, and P = 0.002) [Table 2]. Loss of continuity in capillary loops was significantly more frequent in BD group (60%) than healthy controls (20%) (P = 0.003). Similarly, capillary vascular anomaly was more common in BD group (85%) than healthy controls (40%) (P < 0.001) [Table 3]. Loss of continuity was accompanying the presence of capillary vascular anomalies in 30% of the patients in BD group. Capillary distribution was irregular in 80% of the patients and 30% of the controls. Irregular capillary distribution was identified significantly higher in the patient group compared to the control group (P < 0.001). The medians of the total scores that we obtained from the evaluation of capillary morphology were 38.06 (0–100) for BD patients and 15.38 (0–77) for healthy controls. The medians of the capillary density were 5.36 (3.9–8.0) loops/mm for BD patients and 5.64 (4.7–6.5) loops/mm for healthy controls. Morphology score was significantly higher in BD patients compared to control group (P < 0.001), and the difference between two groups was close to the level of statistical significance in terms of capillary density (P = 0.086). However, no significant correlation was detected between morphology score and capillary density (P = 0.58 and r = −0.076). When we examined the relation between both activity and severity of disease and capillaroscopic features such as capillary morphology and density, we could not detect any correlations [Table 4]. No significant correlation was detected between morphology score and duration of disease (P = 0.44); however, the correlation of megacapillary and microhemorrhage scores with the duration of disease was close to the level of statistical significance, respectively (P = 0.057 and r = 0.304; P = 0.090 and r = 0.272). No correlation was found between age and number of microhemorrhages in the patient group (P = 0.433 and r = 0.127); however, there was a weak positive correlation in the control group since the number of microhemorrhages was increasing as the age increases (P = 0.056 and r = 0.433). There was no additional significant correlation between capillary morphology, distribution, and density with age, gender, duration of disease, concomitant systemic diseases, systemic treatment, or presence of arthritis in BD group (P > 0.05). The relation between acute-phase response parameters (ESR and CRP) and morphology and activity scores was explored. The only correlation that was close to the level of statistical significance was between CRP and BDAIS (P = 0.09 and r = 0.28). There was no significant correlation between other parameters (CRP and morphology score [P = 0.19 and r = −0.210], ESR and BDAIS [P = 0.77 and r = 0.047], and ESR and morphology score [P = 0.68 and r = −0.068]). Smoking was significantly more common in BD patients compared to control group (P = 0.024; Chi-square test). Nevertheless, there was no relation between smoking and microhemorrhage score (P = 0.687), morphology score (P = 0.893), and capillary density (P = 0.165) (Mann–Whitney U-test). Thereby, smoking was not a confounding factor for the capillaroscopic changes both in BD patients and healthy controls. BD is classified as a vasculitis with multisystemic manifestations, and it is characterized by endothelial dysfunction and chronic inflammation., Vascular involvement, which is reported in 18.2% of the cases, includes arterial and venous involvement. Arterial thrombosis, aneurysms, deep vein thrombosis, large vein thrombosis, and superficial phlebitis are the most common forms of vascular involvement; nevertheless, all sizes of vessels may be involved. Therefore, the involvement of the capillaries is an expected finding in BD. The observation of the skin capillaries is generally made at the nailfold, because here capillaries run parallel to the skin surface, while in other areas they appear in a perpendicular state. Normal findings of NC are characterized by homogeneous distribution of hairpin-shaped capillaries in the nailfold plexus without capillary loss (normal medium density, linear 30 capillaries per 5 mm), and absence of morphological alterations., The observation of the microvasculature with NC helps us to determine the early morphological markers of microvascular damage which has been useful for the early diagnosis of many systemic rheumatic disorders such as systemic sclerosis (SSc), dermatomyositis (DM), SLE, antiphospholipid syndrome, and Sjögren's syndrome., BD was also suggested to have a detectable alteration in microcirculation for which nailfold videocapillaroscopy can provide qualitative and quantitative information to predict the degree of vascular damage. The first study in the English literature about the periungual capillaroscopic findings of BD was reported by Wechsler et al. in 1984. They observed microvascular changes in 73% of their 30 BD patients. Similarly, abnormal nailfold capillary findings were noted in 75% of 33 BD patients by Vaiopoulos et al. in their study where they used a stereomicroscope. Movasat et al. reported abnormal findings (dilated loops, hemorrhages, and loss of capillaries) in 40% of 128 patients. In their recent study, Aytekin et al. reported a close frequency of abnormal capillary morphology using videodermatoscopy. They observed at least one capillaroscopic change in 37.5% of their 40 BD patients. In our study, we detected capillary vascular anomaly in 85% of 40 BD patients. The difference between our results and the last two studies may be attributed to the high prevalence of capillary deformity observed in our patients. Movasat et al. did not include this criterion into the evaluation of capillary changes, and Aytekin et al. did not detect any ramified, tortuous capillaries in their BD patients. It has been suggested that dermatoscopy can replace capillaroscopy for the detection of nailfold capillary morphological changes.,,,,,,,, All of the studies about nailfold capillary abnormalities in BD were performed using capillaroscopy, except the most recent one reported by Aytekin et al., for which they used videodermatoscopy.,,,, Our study is the first one performed using both dermatoscopy and videodermatoscopy. The capillary density has a prognostic and predictive value in connective tissue diseases such as SSc. A decrease in the capillary density is recognized as a sign of possible clinical complications in SSc. Patients with psoriasis were also reported to have a decreased capillary density in the studies performed by NC., Morphologic alterations such as coiled and tortuous capillaries were also detected to accompany the decrease in capillary density in psoriasis. In our study, abnormal capillary morphology was observed significantly more in BD patients; however, although there was a decrease in the capillary density compared to controls, it was not prominent. Endothelial dysfunction, which is considered to play an important role in the pathogenesis of vasculitis and thrombosis in BD, might have an additional effect in the mechanism of capillary changes in BD. Patients with longer disease duration are expected to have more severe damage in the capillaries. Accordingly, there was a weak correlation in megacapillary and microhemorrhage features with duration of disease in our study. Although ESR and CRP are the most common parameters of acute-phase response, their relationship with clinical disease activity in BD was not certain, and there is no specific laboratory marker for clinical activity of BD yet. However, Melikoǧlu et al. reported that they found a significant positive correlation between acute-phase reactants (ESR-CRP) and BDCAF score. We also detected a weak correlation between CRP and BDAIS, showing that both CRP and BDAIS might be reliable indicators of clinical disease activity in BD. One of the main objectives of our study was to develop a scoring system for nailfold capillary changes to predict the activity and severity of BD; however, we could not detect a significant relation in capillary morphology and density with activity and severity of BD. We studied nailfold capillary changes in BD using both dermatoscopy and videodermatoscopy. Morphologic features could be readily evaluated by dermatoscopy; however, we preferred videodermatoscopy only for the measurement of capillary density. All nailfold capillary morphologic changes were observed significantly more common in BD patients than healthy controls, but the decrease in capillary density in BD patients was not prominent. We also detected that capillary dilatation and microhemorrhages were more common in long-term disease. Although we could not demonstrate a significant relation in capillary changes with activity and severity of BD, we consider that NC performed by dermatoscopy can reflect the presence and extent of microvascular involvement and thereby might have diagnostic and prognostic value in BD. Behcet H. On relapsing, aphthous ulcers of the mouth, eye and genitalia caused by a virus. Dermatol Wochenschr 1937;105:1152-7. Wechsler B, Le TH, Mouthon JM, Cabane J, Godeau P. Periungual capillaroscopic aspects in Behçet's disease. Apropos of 30 cases. Ann Dermatol Venereol 1984;111:543-50. Vaiopoulos G, Pangratis N, Samarkos M, Hatzinicolaou P, Mavropoulos S, Tzonou A, et al. Nailfold capillary abnormalities in Behçet's disease. J Rheumatol 1995;22:1108-11. Pasqui AL, Pastorelli M, Puccetti L, Beerman U, Biagi F, Camarri A, et al. Microvascular assessment in Behçet disease: Videocapillaroscopic study. Int J Tissue React 2003;25:105-15. Movasat A, Shahram F, Carreira PE, Nadji A, Akhlaghi M, Naderi N, et al. 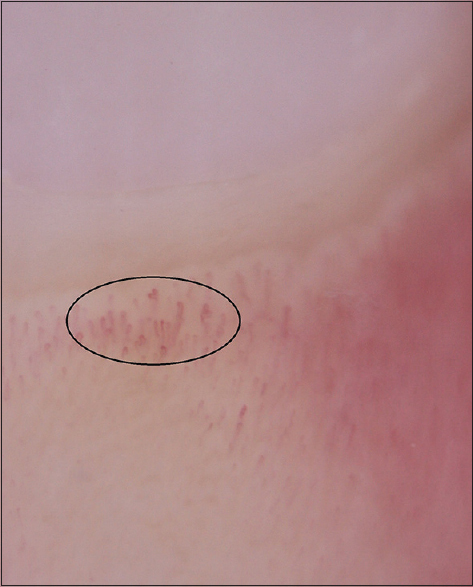 Nailfold capillaroscopy in Behçet's disease, analysis of 128 patients. Clin Rheumatol 2009;28:603-5. Aytekin S, Yuksel EP, Aydin F, Senturk N, Ozden MG, Canturk T, et al. Nailfold capillaroscopy in Behçet disease, performed using videodermoscopy. Clin Exp Dermatol 2014;39:443-7. Cutolo M, Sulli A, Smith V. How to perform and interpret capillaroscopy. Best Pract Res Clin Rheumatol 2013;27:237-48. Bergman R, Sharony L, Schapira D, Nahir MA, Balbir-Gurman A. The handheld dermatoscope as a nail-fold capillaroscopic instrument. Arch Dermatol 2003;139:1027-30. Akay BN, Sanli H, Topcuoglu P, Arat M, Akyol A. Nailfold capillary abnormalities are prevalent in sclerodermoid graft-versus-host disease and readily detected with dermatoscopy. Br J Dermatol 2010;162:1076-82. Dogan S, Akdogan A, Atakan N. Nailfold capillaroscopy in systemic sclerosis: Is there any difference between videocapillaroscopy and dermatoscopy? Skin Res Technol 2013;19:446-9. Hasegawa M. Dermoscopy findings of nail fold capillaries in connective tissue diseases. J Dermatol 2011;38:66-70. Beltrán E, Toll A, Pros A, Carbonell J, Pujol RM. Assessment of nailfold capillaroscopy by x 30 digital epiluminescence (dermoscopy) in patients with raynaud phenomenon. Br J Dermatol 2007;156:892-8. Baron M, Bell M, Bookman A, Buchignani M, Dunne J, Hudson M, et al. Office capillaroscopy in systemic sclerosis. Clin Rheumatol 2007;26:1268-74. Muroi E, Hara T, Yanaba K, Ogawa F, Yoshizaki A, Takenaka M, et al. Aportable dermatoscope for easy, rapid examination of periungual nailfold capillary changes in patients with systemic sclerosis. Rheumatol Int 2011;31:1601-6. Bauersachs RM, Lössner F. The poor man's capillary microscope. A novel technique for the assessment of capillary morphology. Ann Rheum Dis 1997;56:435-7.
International Study Group for Behcet's Disease. Criteria for diagnosis of Behcet's disease. Lancet 1990;335:1078-80.
International Study Group for Behçet's Disease. Behçet Disease Current Activity Form; 2006. Available from: http://www.behcetdiseasesociety.org. [Last accessed on 2014 Dec 03]. Krause I, Rosen Y, Kaplan I, Milo G, Guedj D, Molad Y, et al. Recurrent aphthous stomatitis in Behçet's disease: Clinical features and correlation with systemic disease expression and severity. J Oral Pathol Med 1999;28:193-6. Maricq HR. Wide-field capillary microscopy. Arthritis Rheum 1981;24:1159-65. Acikgoz N, Kurtoǧlu E, Yagmur J, Kapicioglu Y, Cansel M, Ermis N. Elevated monocyte to high-density lipoprotein cholesterol ratio and endothelial dysfunction in Behçet disease. Angiology 2018;69:65-70. Ünlü M, Arslan Z. The relation between neutrophil-lymphocyte ratio and endothelial dysfunction. Angiology 2015;66:694. Davatchi F, Shahram F, Chams-Davatchi C, Shams H, Nadji A, Akhlaghi M, et al. How to deal with Behcet's disease in daily practice. Int J Rheum Dis 2010;13:105-16. Cutolo M, Sulli A, Secchi ME, Olivieri M, Pizzorni C. The contribution of capillaroscopy to the differential diagnosis of connective autoimmune diseases. Best Pract Res Clin Rheumatol 2007;21:1093-108. Ribeiro CF, Siqueira EB, Holler AP, Fabrício L, Skare TL. Periungual capillaroscopy in psoriasis. An Bras Dermatol 2012;87:550-3. Balta S, Balta I, Demirkol S, Ozturk C, Demir M. Endothelial function and Behçet disease. Angiology 2014;65:657-9. Melikoglu M, Topkarci Z. Is there a relation between clinical disease activity and acute phase response in Behcet's disease? Int J Dermatol 2014;53:250-4.